WASHINGTON — Commuters on Virginia Railway Express may have to pay more for their trip starting this summer, as the rail service adds a new Fredericksburg line train, opens the new Spotsylvania station and makes safety upgrades. VRE is proposing a four percent fare hike, and a $2 increase in the cost of Amtrak step-up tickets beginning in July. The fare hike would cost a rider with a monthly pass from Fredericksburg to Union Station about $12 more per month, a rider from Broad Run or Manassas about $10 more per month and a rider from Woodbridge about $9 more per month. Single-trip tickets for those trips would cost about 40 cents more. VRE will hold public hearings on the fare increases over the next few weeks. They are expected to cost riders a total of $900,000 in the fiscal year beginning in July, while allowing funding from the local governments involved in VRE to remain flat. Fairfax County Braddock District Supervisor John Cook, the new leader of the VRE Operations Board, says fares have not gone up for two years, and a fare increase will help cover inflation as well as safety changes such as the implementation of positive train control. That is a safety system the National Transportation Safety Board calls critically important, since it tracks trains’ exact positions and can automatically hit the brakes to cut down on the severity of a collision or avoid it entirely. Federal law requires positive train control across the country by the end of this year, but many railroads will not have it installed by the deadline. Metro has been working to restore a different system, automatic train operation, to Metro trains, which has been disabled since the 2009 Red Line crash was tied to a switch that failed to recognize a train on the tracks. That system has now begun to return to the Red Line, and will return to other lines after more upgrades are completed. While Metro staff are concerned that a potential fare hike this fall could impact ridership, Cook believes this fare hike will not shift VRE riders away from the commuter rail system. About 10,000 people take VRE each workday rather than adding another car to the traffic on Interstate 95 or Interstate 66. In the near term, VRE hopes to lengthen platforms and add more cars to existing trains so that about 2,500 more people could take advantage of the system. Based on current infrastructure, VRE only has a few more open slots to add entirely new trains since VRE operates on tracks that are run by freight railroads CSX and Norfolk Southern or by Amtrak. 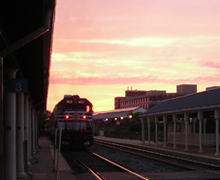 Longer-term plans for VRE include an extension out to Gainesville and Haymarket, and better connections at more times of day through to D.C. and Maryland. Cook says just the expansion to Haymarket and Gainesville may be five to ten years off. The changes needed to allow MARC or VRE trains to run beyond the District involve even more planning, and therefore more time, almost certainly including a replacement or addition to the Long Bridge over the Potomac. “There needs to be another track put there so we can get more trains into D.C. … but in rail things take some time, so you need to be planning for the future,” Cook says. Cook believes last year’s system plan, and the goal this year of a full plan for paying for that future growth, have VRE on the right track to serve more people in the next few years. The public hearings to weigh in on the fare increases begin on Feb. 18 in Stafford and end March 5, 2015 in Fredericksburg. Written comments can be emailed to publiccomment@vre.org or mailed to Bryan Jungwirth at 1500 King Street, Suite 202, Alexandria, Virginia 22314.